Lesson: The Slope of a Line | Algebra 1 | Math Tutor Inc.
Our Algebra 1 tutorial software program contains over 60 topic areas. One of them is The Slope of a Line, and this page summarizes the main ideas of this topic. This page is intended for review, and is not a substitute for the interactive, self-paced tutorials of the MathTutor algebra 1 software program. One property of a line is its "steepness." In algebra, steepness is defined by SLOPE. 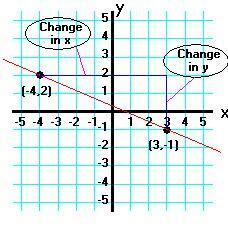 By definition, slope = change in y/change in x. 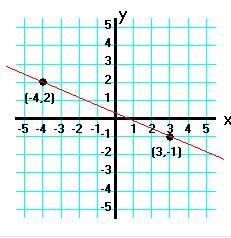 The change in y and the change in x are shown in the graph below. The slope of the line connecting the points (a,-1) and (-2,-2) is 1/7. What is a?